If you visit St. Andrew’s in Victoria, you will find an upright Bell piano with a brass plaque that tells the story of how God sent a piano across the country to find a son in exile. David Vuckson comes annually to tune our piano at West Shore, a new church in Victoria’s western suburbs. When he does, I enjoy looking over his shoulder at the action of the piano that he donated. David enjoys talking about piano construction, and particularly about ours—a Gerhard Heintzman upright. David was here in Dec. 2008 and pointed out: “Your piano is in remarkably good shape for its age.” We were within a few weeks of our piano’s 100th birthday. It was agreed that David and his wife, Pam would be our guests. I have no idea what that means, but David makes it sound like something to which every church parlour should aspire. Note to self—never dampen your sevenths. In addition to his concert, which sent everyone home singing old Broadway show tunes, David told us how God used a piano to find him and Pam and lead them back to faith. David was raised in Collingwood, Ont., where he attended First Presbyterian. Eventually he drifted away from home and from his faith. 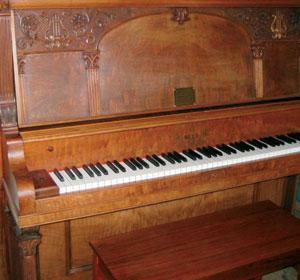 He moved to the west coast where he pursued his profession tuning pianos, not giving much thought to his creator. One day while working in the music shop, one of his colleagues mentioned they had acquired a Bell piano taken in on consignment. Some might see a coincidence and no more. But the Holy Spirit used this improbable coincidence to tap David on the shoulder. And most importantly, David heard the voice. David quoted the gospel of John: “Except the Spirit draws a person, no one comes to God”. “So it was the catalyst for the nudging of the Spirit?” I asked. David bought the piano and donated it to St. Andrew’s, recommending that the church give its spare piano, the Heintzman, to West Shore. And so David’s boyhood Bell piano sits in St. Andrew’s social suite as a reminder both of the lengths God will go, and that He will use the language you know best to remind you where home is. This article originally appeared in the Presbyterian Record and is appears here by permission of the author.